Ueno Park known for the beautiful cherry blossoms is the important cultural and art center in Tokyo. It is also a home to many museums with great exhibitions, concert halls, educational institutions, zoo and always bustling with people. Don't just walk by without checking out the great architecture there as it is a wonderful place to see the great works from early 1900 till recent designed by great architect such as Le Corbusier, Kunio Maekawa, Tadao Ando, Yoshio Taniguchi. We will navigate you through these witness of the history in relaxing Ueno park. The tour starts from the world famous architect, Le Corbusier-designed National Museum of Western Art housing the western paintings and sculptures from pre 18th - 20th century. This museum was listed as a UNESCO World Cultural Heritage Site for its modern architectural value in 2016. We would explain how his concept adapted to the actual work and find out why this museum is so special. After the National Museum of Western Art, we will take a look at Tokyo Bunka Kaikan designed by Kunio Maekawa, one of three local apprentices of Le Corbusier. 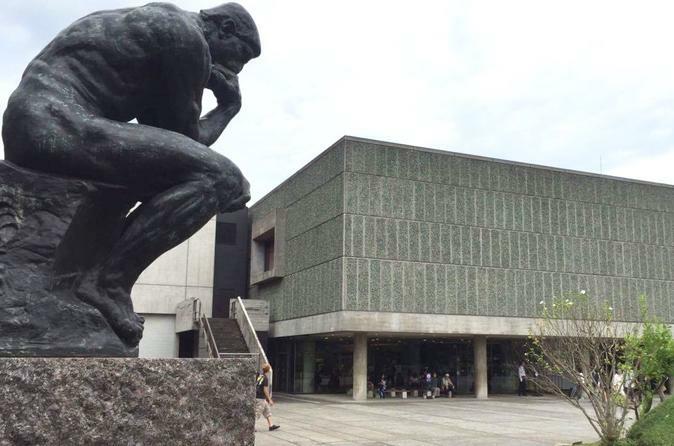 Tokyo Bunka Kaikan is located just opposite to Le Corbusier’s museum as if both buildings were talking each other. Our next stop is one of the oldest buildings constructed in 1906, the International Library of Children’s Literature. You can also observe its great preservation and renovation work as well as newly built stunning arch-shaped annex building done by Tadao Ando. Finally at the end, we will stop at Tokyo National Museum admiring four great architectural works (Hyokei-kan, Hon-kan, Toyo-kan and Gallery of Horyuji Treasure) reflecting historical background of each era between 1908 to 1999. If you have time, please appreciate their collections of National Treasure after the tour!